Since 2013, Netflix’s stated aim has been to win “moments of truth.” That is, those points in time when someone chooses to watch Netflix, rather than do something else. More recently, the company has said its greatest competitor for attention is phenomenally popular video game Fortnite, suggesting it has little to worry about from its traditional TV and online video rivals. 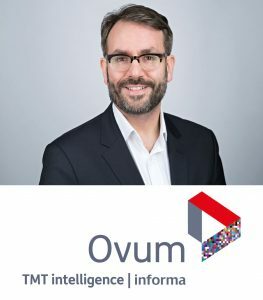 It’s a timely soundbite, but how far has Netflix come and how far can it go? Netflix is winning moments of truth by the bucketload. Nearly half (48%) of Netflix viewers surveyed said they watch Netflix more than any other TV and video service, with 92% putting it in their top three. The first data point seems to confirm that the pioneering online video service is much more than just a “top-up” to traditional TV for many subscribers. When head-to-head with Amazon Video, Netflix is first choice for most subscribers. Nearly 40% of respondents who subscribed to both Netflix and one of Amazon’s video offerings said they watch Netflix the most. Only 16% picked Amazon and few took the retail giant’s services alone: about two out of three (63%) Amazon video subscribers said they also subscribed to Netflix. Netflix is also sharply dividing pay-TV subscribers’ loyalties. 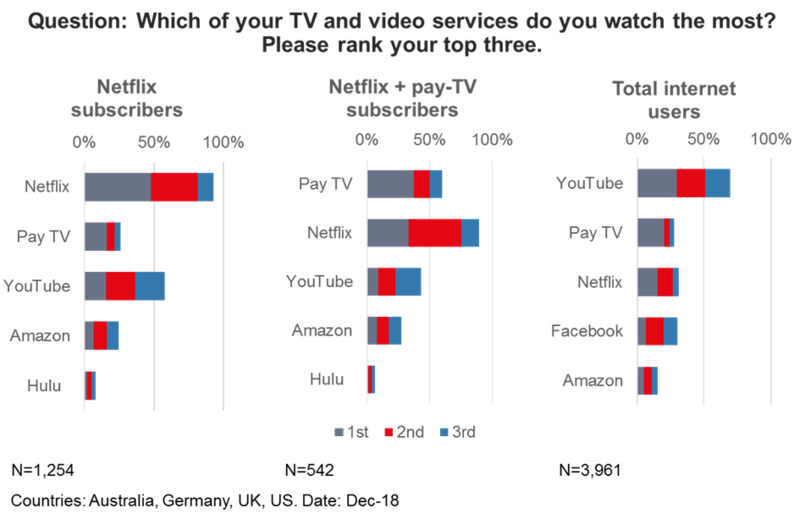 Less than 38% of respondents who subscribed to both traditional pay TV and Netflix said they watched pay TV the most, only marginally more than the 33% who voted Netflix. Subscribers to major operators such as Comcast and Sky seem to be slightly more loyal, with about half favoring these services over Netflix. No platform, not even Netflix, should underestimate YouTube. Google’s video service might lack Netflix’s gloss, but 29% of total respondents said they watched the leading home of rough-and-ready user-generated content the most, and 68% put it in their top three. 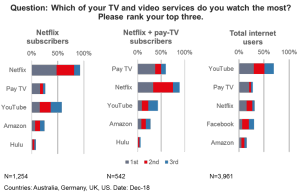 Over 15% of Netflix subscribers even ranked YouTube number one and nearly 60% in their top three (see Figure 1). National broadcaster joint ventures (JVs) are a greater threat – in theory. Local TV is still hugely popular. Over 55% of UK respondents ranked BBC iPlayer as a top-three viewing choice, while ITV Hub and All 4 were chosen by 36% and 19%, respectively. JVs by these players and others elsewhere could make a greater dent in Netflix’s share – provided they can untangle messy rights agreements and competitive conflicts. Easier said than done. Only the strongest “re-intermediaries” will win out, come what may. Regardless of whether Netflix, Disney+, or broadcaster JVs prove most popular, those that provide the best single platform where consumers can access all these apps and more in one place – Amazon, Roku, pay-TV operators, and soon, Apple – will benefit, through consumer subscription charges, revenue shares from app providers, and advertising fees.